Shiloh Moore lives in South East Queensland, Australia. Now in her mid 30’s, she has lived with severe Myalgic Encephalomyelitis/Chronic Fatigue Syndrome (ME/CFS) and Fibromyalgia (FM) since age 10, as you can read about in her advocacy pages. She expresses herself through art and writing to both describe and escape from constant pain. Throughout her decades of illness she has grieved deeply all losses. After many years she has come to a stage of acceptance of her life with illness and believes her ‘life’ is far beyond her ‘life situation’. Despite continued illness, Shiloh loves to laugh, loves people and is grateful for the beauty and joy she finds in simply being. Shiloh is a self-taught artist. She can only sit up for short periods at a time, so her art is often drawn while lying down, then painted in short spurts sitting up. By doing short spurts she is able to ‘pace’ herself to minimise pain. The size of her artwork is small (5×5”, 4×6”, 5×7” and 8×10”) due to pain limiting movement in her arms. After each artwork is completed, she needs time to recover. Each artwork therefore represents a huge investment of Shiloh’s time and limited energy supplies, which makes her artwork all the more special. She also lovingly creates hand made cards. Shiloh feels it is worth the pain as she enjoys looking at her artwork and loves sharing it with others. It gives her a sense of purpose, achievement and quality of life. Writing has been cathartic and therapeutic for Shiloh. From age 16 to 23 she wrote her book of poetry, ‘Stranger in the Moving Chair.’ In it she openly expressed her pain as well as observations of life around her and her passion for life. Feedback from the publication has been powerful and has warmed her soul. Copies are available to buy (AU$15ea) through Shiloh’s contact page. Shiloh is passionate about: friendship, people, animals, emotions, spirituality, laughter, equality, peace, joy, hope, cards, correspondence, art, music, anything handmade, random acts of kindness, and finding beauty in the ordinary. She is drawn to cheesy teenage drama and dance movies and has a cheeky sense of humour! 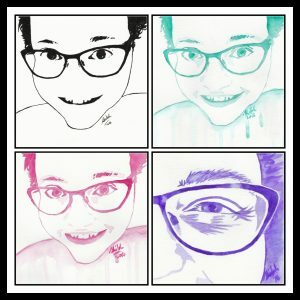 She hopes that from this site you can catch a glimpse of both the seriousness of ME/CFS and FM and the joy of creativity. Mugs, phone cases and more! These are some examples of Shiloh’s original artwork. Click the “view more” button below to see the full gallery. If purchasing something, please be aware that due to Shiloh’s illness she cannot guarantee a set delivery time for your purchase.